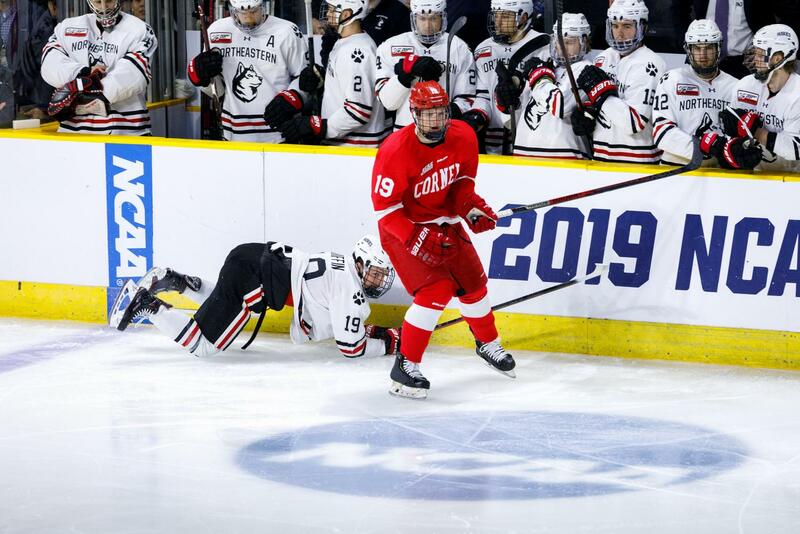 Lincoln Griffin loses his footing in front of the NU bench Saturday as the Huskies lost, 5-1 to Cornell in the NCAA Tournament. 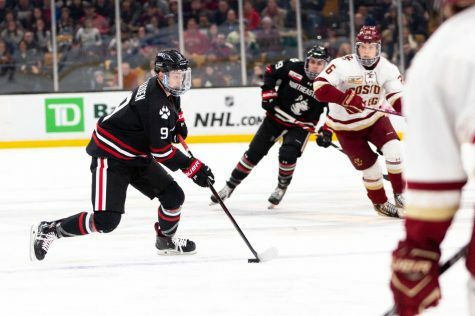 Northeastern’s two-trophy season came to an end Saturday, as the Beanpot and Hockey East champions fell to Cornell, 5-1 at the Dunkin’ Donuts Center in Providence, Rhode Island. The Huskies (27-11-1) battled the Big Red (21-10-4) in the first round of the NCAA Tournament Saturday. 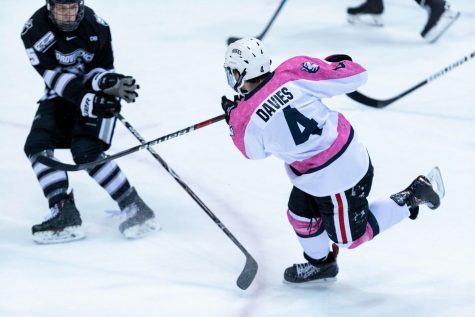 The winner would go on to play Providence in the regional final after the Friars beat Minnesota State, 6-3 in the early game. 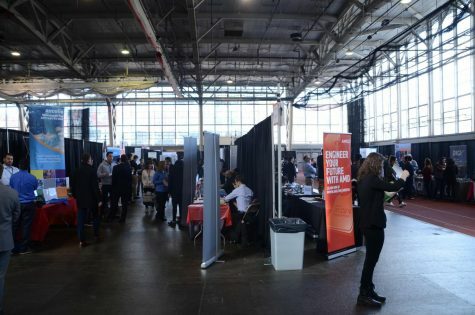 To round out what was already a devastating day for Northeastern, Sportsnet reported shortly after the game that star sophomore goalie Cayden Primeau will leave the program to start his professional career in the Montreal Canadiens’ system. Cornell struck first about four minutes in with a wrister from the high slot by senior forward Beau Starrett. The 6’5” center drifted through the NU zone and waited for NU defenseman Eric Williams to drop before unloading a shot toward Primeau. Primeau made contact with the shot, but it slipped through his grasp and rolled into the back of the net, giving Cornell the 1-0 lead. A pair of penalties by Cornell’s Morgan Barron gave NU two golden power-play opportunities. However, the Huskies only generated one shot on goal across the two power plays, with Cornell’s defense standing strong and forcing NU to keep cycling the puck without the chance to generate shooting angles. At the end of one Cornell held the 1-0 lead. Shots were even at eight apiece, but Cornell’s size allowed them to control the physical aspects of the game and maintain plenty of zone pressure. Northeastern’s chances came primarily on the counter-attack, with Liam Pecararo generating a few scoring opportunities and Matt Filipe having a golden chance early on. Cornell scored its second less than a minute into the second period. Forward Mitch Vanderlaan latched onto a pass from Alec McCrea and strode forward on the rush into the NU zone. He deked past NU’s Ryan Shea before lining up a left-handed wrister to beat Primeau at the far post. After Cornell killed off a third Northeastern power play, sophomore forward Morgan Barron scored their third goal. Barron grabbed a loose puck and executed a wraparound going from left to right, sliding the puck between the legs of Primeau. Three minutes later, Cornell scored its fourth. On their first power play of the game, McCrea ripped a shot from the blue line straight at Primeau, but the NU keeper spilled the puck in front of the net, leading to a scramble. Eventually Michael Regush tapped the loose puck through Primeau’s legs for the commanding lead. Northeastern got its paws on a goal late in the second with a power-play strike from Pecararo. After a shot from Jeremy Davies was blocked in front of the net, the rebound fell invitingly to Pecararo, who hit one past Cornell goalkeeper Austin McGrath from a tight angle to the right of the net to cut the Cornell deficit down to three. The Huskies opened the third period strongly, but it was Cornell ended all hopes of a comeback by making it 5-1 early in the third. Brenden Locke received a pass in the slot and ripped a one-timer past Primeau. Northeastern’s season ended with the final buzzer, but it was a successful year for the program. 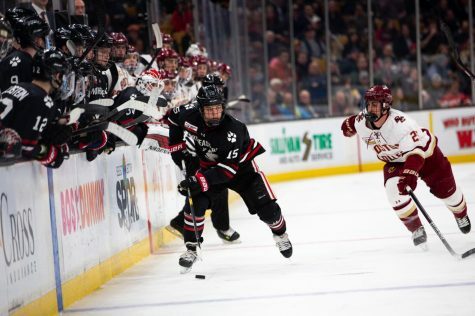 Their 27 wins set a program record, they won their second straight Beanpot trophy and they battled their way through the Hockey East tournament, beating Maine, Boston University and Boston College to win the title. 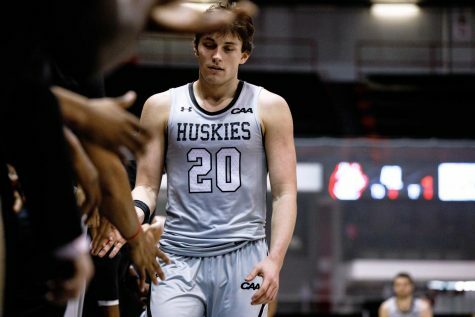 The Huskies will look ahead to the 2019-20 season after one of the best seasons in program history. 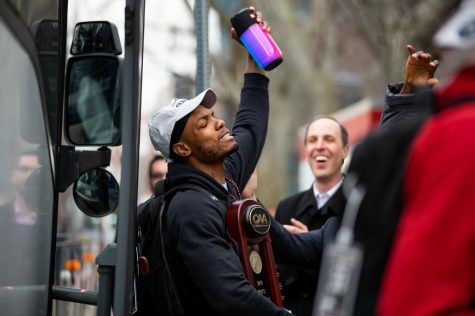 While they did not advance in the NCAA Tournament like they certainly would have hoped, the future remains bright for the Huskies. 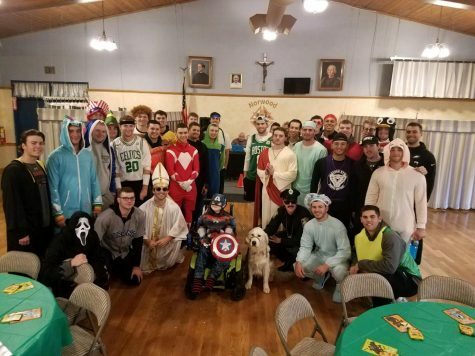 “It hasn’t really sunk in yet, but looking back on it, we’re the greatest team to ever wear the Husky logo, and that’s gonna be a feeling that’s going to last a lifetime,” sophomore forward Zach Solow said.